The Troop will travel to Mt. Cranmore to Ski, tube and coast the mountains. The Troop will summit the 3,165 ft Mt. Monadnock one of the most climbed montains in the world. The mountain offers great views, and on a good day, you can see all the way to Boston. We will camp nearby at Camp Wanocksett in Jaffrey, NH. This is the traditional first camping trip for the new Scouts at Camp Greenough in Yarmouth, MA. The Troop is in for an adventure when they paddle their kayaks a mile in Knubble Bay to Beal Island. The island is owned by the Applachian Mountain Club (AMC), and only allows 30 campers at a time. Ospreys, seals, eagles and porcupines are some of the critters that we'll likely see. Note: Cost for this trip is $110. How well do you know Boston? Can you find stuff? Ever been behind the counter of a Dunkin Donuts? Have you been to Paul Reveres' House? Here's your chance! You will embark on a mission of mystery, investigation, teamwork and documentation as you search the street, alleys and parks of the city of Boston in your quest the historic,the weird and the unexplained. 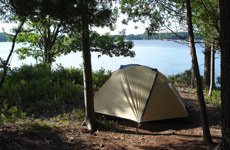 Camping with an International flavor will be the theme for this camping trip to Mohegan Council's Treasure Valley Scout Reservation, a camp established in 1925, in Rutland, MA. Troop 17 goes to the Griswold Scout Reservation in Gilmanton Ironworks, NH to take on the adventure of a week of Summer Camp. The Patrols decided to split this time with some going to the rustic patrol-style Camping of Camp Bell and the other patrols heading to the beatuiful, more traditional-style of Boys Scout camp at Hidden Valley.